Advisory board member, Elke Gibbs, and her family have been an incredible inspiration to us here at JMCDF. Below, Elke recounts her son Jaxon’s struggle with Coats and how they have been working with us to raise awareness around Coats Disease. 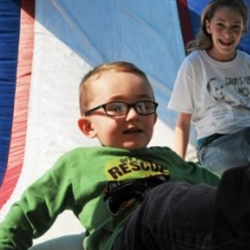 “When our son Jaxon was diagnosed on December 30, 2011, he was 2 years. He was too young to tell us that anything was wrong and never skipped a beat to show us that he was losing vision in his Coats’ eye. When initially diagnosed, the ophthalmologist performed a CT, ultrasound and a MRI to rule out Retinoblastoma. Since Jaxon was only 2, he had to be put under anesthesia each time a test was done. Jaxon was under anesthesia during an ultrasound and the doctor came out to tell us that he didn’t see calcium, but wanted to do a MRI to rule out Retinoblastoma. He thought it was something called Coats’ Disease. Since Jaxon’s case was in the later stages we were still possibly talking eye removal. He also said that if we went back and looked at pictures we would probably notice a glow in the affected eye. I will never forget this gut wrenching feeling I had that if I would have known about the glow that we could have saved some of Jaxon’s eyesight and even possibly his eye. We felt so helpless and it was a parent’s worst nightmare. For the next several sleepless nights, we were up researching about Coats’ Disease. Family’s living with Coats’ Disease know that there is not a lot of information out there for this disease. We came across the Jack McGovern Coats Disease Foundation and thought WOW what an inspiration! They actually help host annual conferences that doctors from all across the United States come to and talk about Coats Disease. We asked ourselves how can we help JMCDF? My husband is a musician and said to me that he wanted to put on a music/concert event to raise money. On October 20, 2012, we held Jaxon’s Fight: “kNOw Coats”. It featured pumpkin decorating, a hayride, face painting, bounce houses, corn hole, and 2 live bands. Our main goal was to not only raise awareness in our community so other parents can catch Coats’ Disease in the earlier stages, but to also show Jaxon what an inspiration he is to us. We are pleased to report that we were able to donate $6,500 to the JMCDF. We were even fortunate enough to have press coverage.